How can I teach my horse to move away from leg pressure while in motion? 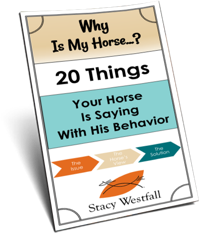 Shauna- Most people begin teaching horses how to move away from leg pressure from the ground. A popular starting point is teaching the horse to move his hip away from pressure resulting in a turn on the forehand; the front feet staying in one location while the hind feet move around them. I also start with this simple exercise. Some horses can learn the turn on the forehand and then apply the same theory while in motion. 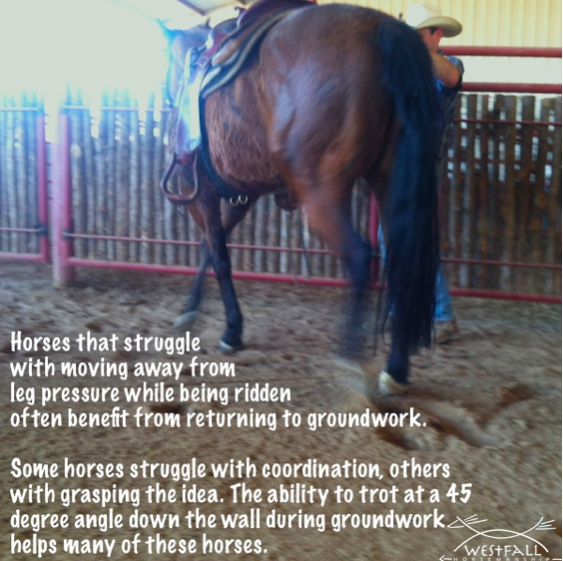 Other horses struggle with this idea and need a little more help. One exercise I use to help horses learn to move away from leg pressure while in motion is groundwork while facing a wall. From the ground I will face the horse toward the wall at a 45 degree angle. Using a dressage whip, to act as my leg would while mounted, I ask the horse to begin moving down the wall maintaining the 45 degree angle. Asking for a side pass (facing directly at the wall) is more complicated and should come later. I like this exercise because if the horse is struggling with the concept while I am mounted they tend to understand quicker using this groundwork method. Also, if the horse is uncoordinated then I can allow him to practice using this method. This can be done at both the walk and trot. Once the horse improves (this could be days of work) then I will mount up and ask for the same thing while mounted. If the horse is confused I will dismount and repeat. Thanks for the (always) excellent advice. 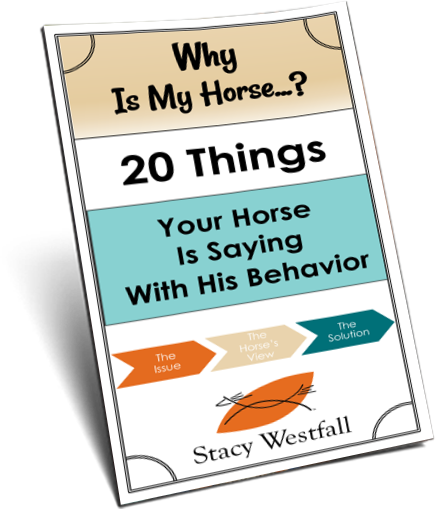 Stacy – do you have a similar trick for getting a horse who is fantastic on the ground for a pivot, to understand the maneuver in the saddle? My horse is a seasoned show horse, but he’s never been very good with a pivot while I’m mounted – but in showmanship, he excels at it. If you have any suggestions, they’d be greatly appreciated!